Discover the name behind Hammer’s classic race timepiece. A watch of remarkable technical content with superior quality finish, a demonstration of the depth of technical horological knowledge that exists in the Manufacture in Neuchâtel. Thanks to the extensive work of skillful skeletonisation and the sapphire crystal porthole in the back, the P.2005/S hand-wound movement with tourbillon escapement, entirely developed and produced in the Officine Panerai Manufacture, is in full view. 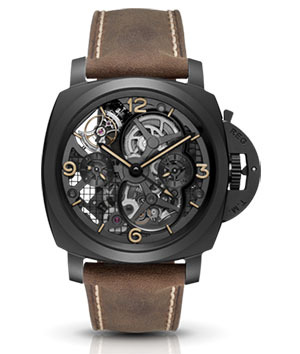 Lo Scienziato – Luminor 1950 Tourbillon GMT Ceramica (PAM00528) is supplied with a strap of natural, untreated leather, fastened by an adjustable buckle in blackened steel. The special presentation case in which it is sold also contains a second black leather strap and a screwdriver.